Cheering with his teammates at the Gadsden City game, sophomore Dylan Betts makes his presence known as a first time cheerleader. 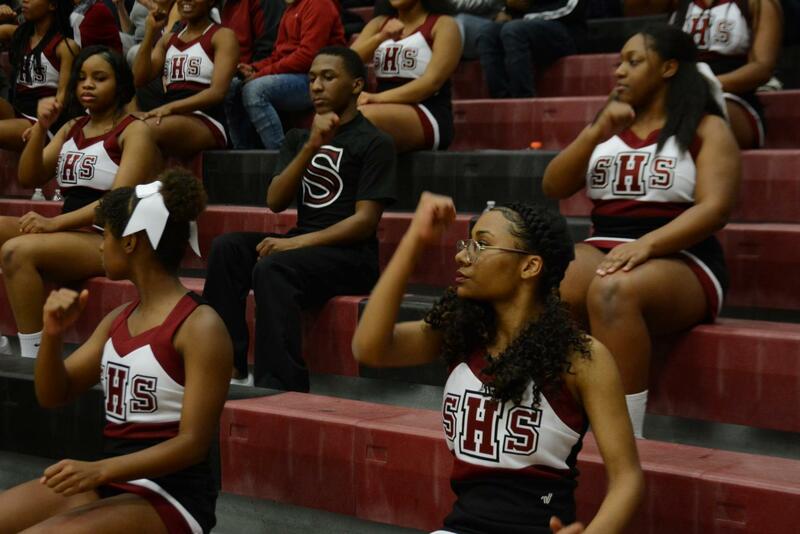 Sophomore Dylan Betts has made school history by being the first male cheerleader on the basketball cheer team. The idea of being a cheerleader is new to Betts. New sponsor, Jessie Graves, added a male cheerleader on the team to introduce change and boost morale. She said males are more likely to have additional upper body strength than females which is a great advantage of adding Betts to the cheer team. “You can do a lot more when you have a male cheerleader because generally not always but usually males are just typically stronger than females because they can lift more weights which means they can lift girls higher or hold them longer then what we could as females,” Graves said. With this being Dylan’s first year of cheering, Betts has become more focused and outgoing towards achieving his goal. He is using his position on the team to break out of his shyness. “It helps me become a louder person, because I use to be quiet and now because of cheerleading I have learned how to be a lot more louder and more bolder,” Betts said. His teammates say that Betts sets a good example for others by showing them that cheerleading isn’t just for females, but rather for all those who wish to express their talents and face their fears.